"This is a great change from beef! 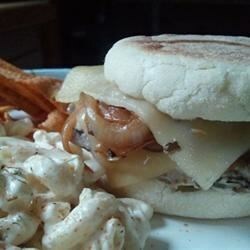 If you like onions and Swiss cheese, you'll LOVE this combination with chicken. Good summer dinner! I serve this with fresh fruit and chips!" Melt the butter in a skillet over medium heat. Place the onion slices in the skillet, sprinkle with garlic powder, and saute until onions are translucent. Remove from heat, and set aside. Lightly oil the grill grate. Place the chicken breast halves on the grill, and sprinkle with wine, rosemary, and thyme. Cook for about 8 minutes. Turn, and continue cooking 8 minutes, or until juices run clear. Place a slice of cheese on each breast half, and top with onions. Cook until cheese starts to melt. Serve on toasted English muffins. Super recipe! My guys ate it up and asked for more! Wonderful summer weeknight dinner! I don't like Swiss so I substituted Provolone. We will DEFINITELY make this one again! Thanks for a great recipe!